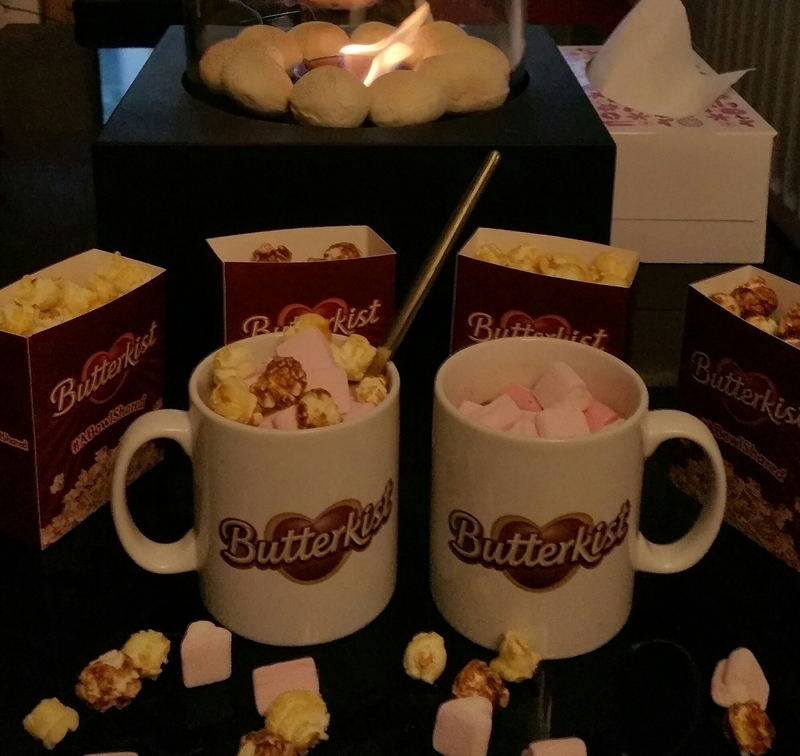 I was very lucky recently to be invited to have a wonderful Girl’s Night In courtesy of Butterkist. I’m at that age where all of my friends are married/cohabiting with children, and free time is hard to find with everyone’s family and work commitments. Before I had my son, I was out with friends constantly or working in a pub in the evenings after work for extra money. But then Luke came along and something strange happened. I couldn’t bear the thought of leaving him with babysitters while I went out, I just wanted to be with him all the time. In the 9 years since he’s been born, do you know how many nights out I’ve had without him? You’ll be shocked. Just two. Two!!! Entirely my choice. A couple of friendships fell by the wayside as a result. The party girl side of me vanished without a trace and the calmer settled side became the new me. There are millions of great things about being a mum, and one of those is the new friendships you make with other mums at playgroups, schools, and clubs. I am so thankful and feel so blessed to have made some very special friendships this way. One such friend is Tracey. I hadn’t seen her for a while. Life has been busy for us both so it’s been a case of communication by Whatsapp for a few weeks. The good thing about technology is it lets you stay in touch with people when you can’t see them. Nothing beats sitting down together having a laugh and a chat though. Tracey was feeling a bit low due to personal family issues, so when Butterkist sent me a big box of goodies, I invited her for a Girl’s Night In. Butterkist knew EXACTLY what would make a perfect night in. 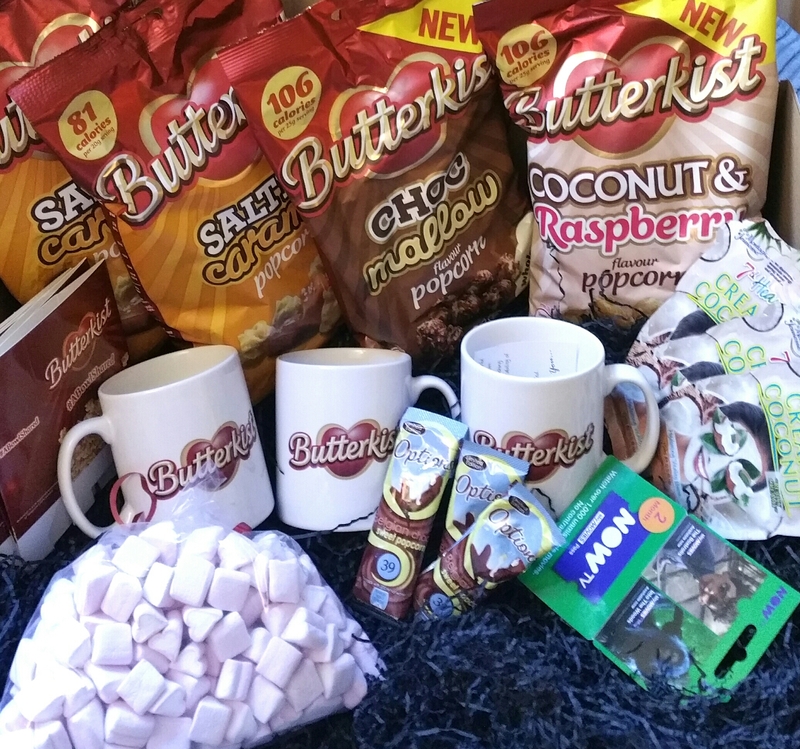 I received a big box containing heart shaped marshmallows and Sweet Popcorn Belgian hot chocolate sachets from Options, along with Butterkist mugs to make them in. There was also Creamy Coconut Face Masks, a 2 month Now TV Sky Movies Pass, and lots of yummy popcorn with special cartons to put it in. My Other Half and Luke were banished upstairs so Tracey and I could enjoy our girly night. No boys allowed, apart from our very cheeky puppy who wouldn’t leave us alone. I made our hot chocolate drinks in our lovely new mugs. Butterkist had wanted to send some squirty cream but Royal Mail had said they couldn’t, but that is one thing that I always have in my fridge. Tracey just wanted marshmallows on hers without cream. I went the whole hog and piled cream, marshmallows and popcorn on mine! While I made the drinks and opened the popcorn, Tracey got the film ready for us to watch. We had chosen an old classic…. Bridget Jones’s Diary. 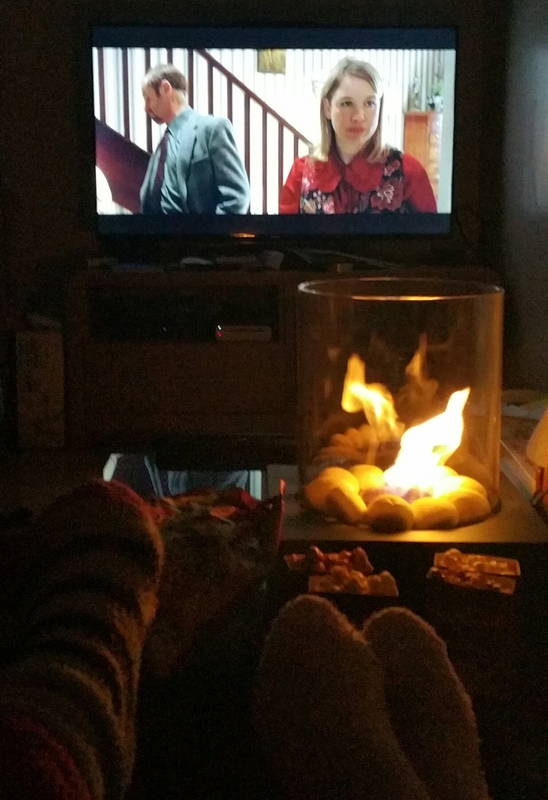 A girly night needs a girly film, and what better than Bridget Jones! I lit the tabletop fire and we were good to go. We laughed and cried together. We’re both soppy and romantic and cry at everything, which is why I had a box of tissues ready too. The famous scene with Bridget and her big granny knickers had us talking about embarrassing dates we’d ever had. There were plenty! I won’t embarrass myself by telling you lot though hehe!!!! Ok I’ll tell you the least embarrassing of mine. I went on a blind date many years ago with a man called Jason. He took me to the cinema to watch The Horse Whisperer (that shows how long ago it was)! There was a premiere room in the cinema with waitress service to your reclining seat, where you could enjoy alcoholic drinks and snacks. I put my seat back and settled down for the film. I was really tired after a very late night the night before but thought I was hiding that fact well. There’s a scene in the film where there’s just lovely music and shots of the beautiful landscape. I can’t remember what else. I was so comfortable in my reclined seat I fell asleep and missed the rest of the film. Jason was not impressed as he had paid extra for us to watch it in that room, and he grumbled about it for quite a while! I did see him a few times after (surprisingly), but that led to a much more embarrassing date which I am NOT telling you about and which was the last time I saw him!! Ahem! Anyway, back to our girly night. 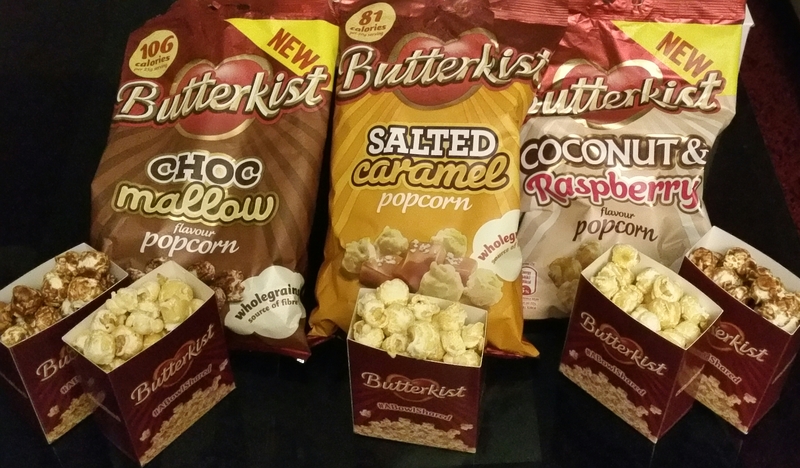 Butterkist had sent sharing bags of their latest flavours to try: Salted Caramel, Choc Mallow, and Coconut and Raspberry. They were all absolutely scrumptious but we both agreed the Choc Mallow was our favourite. You can really taste the chocolatey marshmallow. The pack says there are only 106 calories per 25g serving, the same as for the Coconut and Raspberry. The Salted Caramel only has 81 calories per serving. All 3 are a source of fibre as they contain wholegrains, so the fact we ate copious amounts of them must make us extra healthy, right? Well in my ideal world it does 🙂 The Salted Caramel was the perfect blend of sweetness and saltiness. I find some salted caramels far too salty, and I’m really not a salt fan, but this popcorn was beautiful. I had received 2 packs of that flavour, so I was kind and let the boys take one upstairs to enjoy. The Coconut and Raspberry was amazing too. Some pieces seemed to have a stronger coconut flavour with a hint of raspberry, and some were the other way round, but the overall taste was beautiful. All 3 flavours had wonderful aftertastes too. I will definitely be buying all of these. We often have “cinema nights” in our house at weekends, so I will stock up with these for those nights too. We decided to put our face masks on after the film so that we could enjoy the film without having to stop it to rinse them off. (This slightly scared my puppy who must have thought 2 ghosts had appeared with our white faces, but then he tried to lick them off, so we moved from the sofa to the table so he couldn’t jump up to our faces). The hot chocolates had long disappeared and we had moved on to Baileys over ice. The Choc Mallow popcorn went really well with that! Both lovely creamy tastes. We chatted about life, the universe and everything and put the world to rights. It was such a special night with all the ingredients of perfection… scrummy food, indulgent drinks, good film, a bit of pampering, and lots of laughter. Butterkist, you gave me the perfect excuse to spend quality time with a fab friend, and when she left at the end of the night we both agreed we had really needed that! So thank you. DISCLAIMER: Butterkist kindly sent me all of the products used for free in exchange for a report of my girly night. This in no way influenced my views though as I believe in honesty in all my posts. I would never recommend something I did not like or approve of. I really enjoyed this post. I also go out very rarely without my two sons but I am now thinking I can also have a girls night in.